2018 turned out to be a life changing year, my partner Craig and I started looking for a home of our own and decided to start a family too. Today, Wednesday 16th January marks my 38th week of pregnancy and the day that Craig and I are finally able to pick up the keys to our first home together! Buying a home and having a baby are huge decisions, ones that we’ve spent years talking about. 2018 finally felt like the right time to make our ‘next chapter’ plans a reality. So in spring and summer of 2018 our ‘next chapter’ began as we found out that we were expecting and an offer was accepted on a home of our own. These two big changes shaped our year dramatically and mine in particular as my original plan to get a part time job went out the window. I worked out that with sales from my shop I could still afford to pay my way and decided that being self-employed would work best when it came to welcoming our little one into the world. Luckily Craig’s salary meant that we were able to get the mortgage we needed to get a foot on the first rung of the property ladder. Besides the big changes personally I found 2018 to be a challenging and rewarding year for my art career. January started fantastically well in my online shop. I added the remaining 50 of my 100 day postcard project as well as woodland landscapes and a series on native British trees to my shop which went down very well earning me over £600 for the month. I also wrote a personal blog post in January all about my struggles with the title ‘artist’ and how I overcame my confidence issues and started referring to myself as an artist without hesitation. The post was shared by Jackson Art Supplies on Facebook and has had to date over 1,000 views making it my most read, liked and commented on journal entry. The first half of the year was spent making drawings inspired by my eleven month travels from 2016-17 for my solo exhibition at The Sheep Shed Gallery in Weyhill, Andover. The exhibition took place in July and went well, helping me to establish a working relationship with the gallery and getting my work outside the studio and onto gallery walls. Exhibiting at The Sheep Shed Gallery in July meant that when a spot opened up unexpectedly in September I was one of the first to be offered some wall space which I graciously accepted. I created a small series of tree and landscape drawings to display alongside a fellow local artist and was pleased to be able to add another bit of exhibiting experience to my artist CV. I had my first commissions in 2018, a set of two trees and a robin which I found challenging as I’d only ever been used to making work to my own specification rather than somebody else’s. Luckily the drawings went down very well and gave me confidence in my ability to work to a brief. My social media presence went from strength to strength over the year, I finally achieved over 2,000 Instagram followers and increased my Twitter following from roughly 900 to over 2,000 followers. Focusing on growing my social media helped massively with sales as many of my drawings were bought by people who found me via these channels. 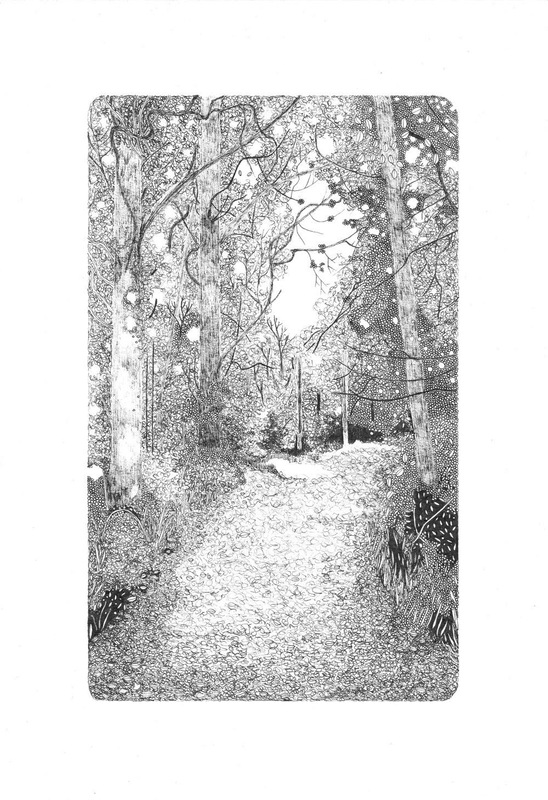 I entered a couple of open submission exhibitions with my drawing Woodland Study IV including the Summer Exhibition at the Royal Academy for the first time. Unfortunately both attempts were unsuccessful and led me to wonder whether the money and effort of entering open submissions was worth it. I shared my thoughts on Twitter and Instagram and was met with such a lovely and supportive response from fellow artists and creatives. A campaign that I greatly admire and support called Just A Card featured me on their blog and Instagram account which was such an honour. I also used my own online space to interview ten artists over the year that I admire with the hope of learning from them and increasing their reach online. As the year drew on my income fluctuated massively, one month I made just £30 from my online shop while other months I’d earn more than enough to pay my rent and bills. I went through some tough moments where I felt irresponsible for deciding to start a family without having built up my art business enough. In the end I had to accept that I was at a point where I couldn’t change things and had to learn to accept help financially from my partner. My hope is that in the future as my online following grows and my work progresses and hopefully improves that I’ll be able to earn more from my shop with original drawings and perhaps develop a range of work that can be made into prints to create a more passive income. Despite the income fluctuations I ended the year with 102 drawings sold, something that I’m very proud of as I think of how far I’ve come since opening my online shop in July 2017. Alongside a year of drawing, pregnancy and house buying I also turned 30 in March, celebrating with a wonderful trip to snowy Norway. I was lucky enough to have a family holiday in Spain in May and a trip to Cornwall and the Forest of Dean where yet again I managed to gather so much inspiration for future work. It’s been quite a year and I have so much to look forward to in 2019 too. I’ve decided to refrain from making goals this year as I have no idea how I’ll adapt to motherhood and how that will affect my life as an artist. Hopefully I’ll be back to drawing in time and my art career will enable me to contribute financially to our little family. Have you written a review of your year or hopes and goals for 2019? I'd love to read if so, let me know in the comments below. I'm a curious type; I like to know what informs an artist. Who or what do they look to for inspiration? How do they work? Each month I will be asking an artist I admire a few questions, this month is Dominique Cameron. Dominique, landscape is at the centre of your practice, what is it about landscape that you find so inspirational? Landscape and walking have always played an important part in my life, from an early age I would walk the countryside with my family and my practice has developed from those earliest times. I have always had the desire to know where it is I live and having moved house many times there has always been this sense of wanting to map any new environment coupled with a curiosity of what lies beyond the door. I'm particularly taken with the series of work that you did inspired by 'The Wood', how do you decide which type of landscape or place to focus all of your attention on for a project? You use colour very vividly in some work and stick to black and white in others, is there any reasoning behind this? My use of colour is dependent on many factors. The large woods paintings were monochrome out of a desire to see the woods pared back. I felt that I could articulate better the space by just using black and white. However it wasn’t simply black paint – there were at least four different kinds of black used. Using colour would have made the immediacy of response more difficult. However the smaller works in oil reflected the sensuousness and richness of the plant life. So in short it does depend on the subject matter. What are the materials that you work with and is experimentation important to you? I work with many kinds of materials from oil, acrylic, charcoal, ink, through to watercolour and gouache. I do like experimenting with their differences and at times in the studio I will often use what’s at hand, and can often be surprised by the result. I am currently interested in the juxtaposition of drawing and painting so will often use both in works, and believe there are no rules in mark making, but play is an integral part of any practice. Can you outline the process of making a piece of work from start to finish? The question of process changes with environment, materials and support. Yet the one constant is the use of gesso. I prime every surface I work on whether that be canvas, wood, panel or paper. I like the ground of gesso that gives a slight tooth and makes the support more durable. I will then go in and out of drawing and painting, building as I go until I either think its time for a cup of tea – and therefore the need to walk away. I will return to sneak up on the work, catching it by surprise almost. I immediately will know where I’ve gone wrong, what needs to be changed, and be startled by my previous decision making – it is almost as if I have not encountered the work before, it feels so new. My studio is a room at one end of the house. It’s the only room that has not had any work done to it. There are doors that open out to the garden and I have a view of the sea. It’s very messy, dirty and piled high with all manner of things. Every now and then I have a clean up as I find I no longer have space. It is not very large but it’s fantastic to have the space close by. If I choose I know I can work in the middle of the night. I take inspiration from many sources, not only painters, and this list can and does change, but the artists that have remained with me would include the painters Ivon Hitchens, Joan Eardley, Cy Twombly, John Virtue and writers Virginia Woolf, Kathleen Jamie, Alice Oswald, and the filmmaker Margaret Tait. Three things about myself – this has proved the most difficult question. Umm…. I like to dance when I work in my studio. I used to be a fire fighter and I do like clothing with roomy pockets - for all my collections of things. You can follow me on twitter - @bourbonandwolfe, and on my website – dominiquecameron.com. Thank you to Dominique for agreeing to be part of my artist interview series. I first found Dominique on Twitter and was immediately attracted to her black and white depictions of woodland, for obvious reasons if you know me and my own work at all. I’d love a studio like hers, with doors that open on to a garden and a sea view to boot, it sounds like the absolute dream. Remember to take a look at Dominique’s website where you can find many more examples of her work on the portfolio page. Dominique’s interview marks the end of my artist interview series, at least for now. Thank you to all of the artists that have taken part this year and to all those that have read the interviews too, I hope you have gained as much from it as I have. I'm a curious type; I like to know what informs an artist. Who or what do they look to for inspiration? How do they work? Each month I will be asking an artist I admire a few questions, this month is Carolyn Roberts. Carolyn, your work is inspired by nature and landscape. What is it about the great outdoors that fascinates you? What are the materials you work with and is experimentation important to you? I work with a variety of mediums depending on the mood and feeling I am trying to capture and convey; from fluid, swirling, pooling watercolours and inks, expressive mark making charcoal through to more buttery acrylics as well collage and mono-printing. I am a sucker for new materials and love to experiment; I have recently discovered the Art Graf charcoal blocks which produce the most wonderful tonal marks as well as Winsor and Newton Professional Artists Watercolour sticks – blocks of pure pigment – that can be used in a variety of ways. Your work is very expressive, can you outline the process of making a piece of work from start to finish? After spending as much time as possible outdoors sketching, taking photographs, sometimes just sitting and listening, I begin to narrow down the elements that are important to me, be it the colour palette, the textures, or a particular detail such as the stone walls of Yorkshire or the watery nature of the fens. In my sketchbook I experiment with the materials I think will best convey the feeling/emotion/experience I want to convey as well as play around with the composition. From there I move to working on paper, across several sheets at once in an attempt to stop me fiddling – well that’s the plan but it doesn’t always work. I work quickly and intuitively. The initial marks and washes are vital; if these don’t convey that sense of freedom, then no amount of ‘fiddling’ will help…. If I am happy with these then I will continue to work, adding further washes or marks as necessary, but I try not to overwork, as I find it’s those first instinctive marks that convey the immediacy of the experience the best. Do you find inspiration for your work locally or do you travel further afield to find inspiration? Growing up and living in Lincolnshire I often visited the fens and coast of North Norfolk. I moved to Leicestershire several years ago and am lucky to live quite close to Bradgate Park – a constant source of inspiration. I also visit the Peak District, Derbyshire quite often as well as the Yorkshire Moors and Dales. The Glen Coe area of Scotland is another favourite place – majestic. I have a love of both the coast and country and love travelling and discovering new areas; the west coast of Scotland is on my admittedly very long list of places to visit. How did studying a fine art degree later in life affect your practice and would you recommend university to aspiring artists? Ha…you could base a whole post around this issue!! I loved drawing as a child but didn’t consider doing it seriously until my children had grown up. Growing up/living in a rural community and leading a relatively quiet life, university took a little getting used to; I hadn’t written an essay for over 30 years!! Also, my cohorts seemed much more confident and knowledgeable than I felt…it took me until part way through my second year before I began to feel as if I had any idea what I was doing…. Something must have clicked as I graduated with a First – my final piece culminated in an installation incorporating sound – nothing like my current work. It certainly made me push my boundaries and opened me up to possibilities. If you feel university is for you, I would recommend you thoroughly research the courses to find the one that offers you what you want. If university taught me anything it is to have faith or confidence in myself – if I could produce work, write essays and reports, deal with critiques, debate, discuss, submit a dissertation and create a final piece that went on to be displayed in two further exhibitions – then I can do anything!! I would love to say I have a fabulous, custom made studio at the bottom of the garden… the reality, as for a lot of artists, is nothing as grand. My ‘studio’ is the smallest bedroom and has to work as a creative space, study and office…. I would love a larger space as I want to work on a bigger scale as well as have room to put all my books and collection of shells, stones, feathers, images etc on display…. Back in the mists of time, I trained as a horse-riding instructor. I am on Twitter as @CJRFineArtist, my Instagram page is carolynjrobertsartist and Facebook page is Carolyn J Roberts Artist. Thank you to Carolyn for agreeing to be part of my artist interview series. Carolyn uses her Twitter account to tirelessly help promote the work of others and it’s always a joy to see her own work pop up in my feed. I love how expressive her marks are and how they really give the viewer a feeling of wild and rugged landscape. Carolyn sells her work via her website, follow the link here to have a look.